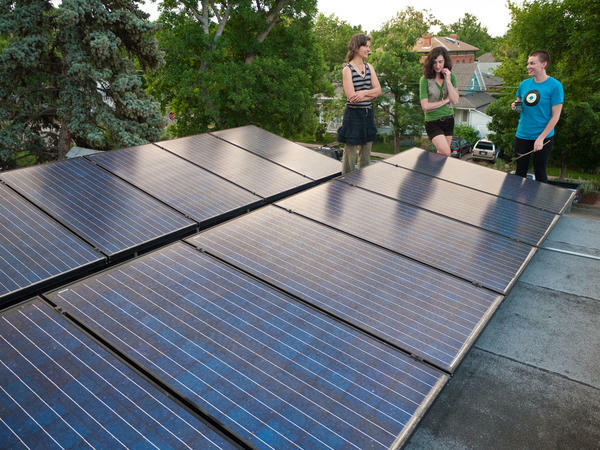 It’s a bright time for residential solar in the US, with residential solar PV installations exceeding commercial solar installations for the first time ever in the first quarter of 2014. The latest US Solar Market Insights report from the Solar Energy Industry Association (SEIA) was packed full of positive information about the state of solar in the US, including the fact that in Q1 of 2014, 74% of new electric generating capacity in the country came from solar. Residential solar was booming in Q1 of 2014, with new residential installations up 38% over Q1 of last year, and PV system prices fell 7% over the same period, going from $4.91/W to $4.56/W. The relatively irregular and volatile nature of the utility-scale solar market, combined with a growing demand for residential solar, contributed to the dominance of residential installations this quarter. The residential solar sector is also helping to boost local economies, both through the creation of green jobs, and through the long-term savings possible to solar homeowners, which effectively puts money back in their pockets as well. Another heartening trend in residential solar this past quarter is the fact that over one third of home solar installations during this period were not underwritten by any state solar incentives, which is another first. This trend hints that regardless of the types and amounts of incentives for home solar systems, homeowners continue to see the benefits, both financial and environmental, of generating power from the sun’s energy, especially over the long run. School, nonprofit, and government solar installations added more than 100MW of capacity this quarter, for the second quarter in a row. The price of installed residential solar systems came down in most of the major residential markets, including Arizona, California, Arizona, New York, and Massachusetts. The average price of a solar panel has dropped 60% since 2011. Commercial solar costs fell 5.7%, when compared to the same period last year, dropping from $3.95/W to $3.72/W. Concentrating solar power (CSP) had a huge first quarter, and 2014 is expected to be the biggest year ever for this solar technology. The Ivanpah CSP project (392 MW) came online last quarter, as well as the second phase (125 MW) of Genesis Solar’s CSP project, and by the end of the year, a total of 857 MW of CSP power is expected to be up and running. The utility PV segment has grown by 171% since Q1 of 2013, and the first quarter of 2014 saw 873 MW of solar installed by utilities. 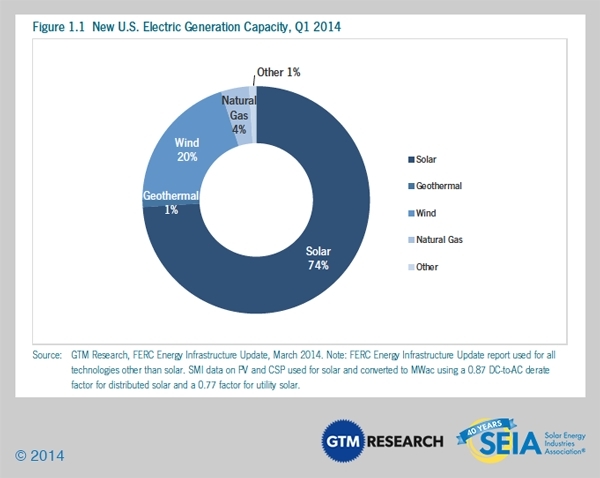 2014 is forecasted to be a banner year for solar in the US, as GTM Research and SEIA estimate that 6.6 GW of solar will be installed, which will be a 39% increase over 2013’s figures, and almost doubling the size of the 2012 solar market. Not only does going solar make a lot of financial sense in a market where energy prices are only going to continue to rise, but investing in clean renewable energy such as solar, which will generate electricity for decades with the same initial costs, also makes a lot of environmental sense. Between reducing local and regional air pollution, reducing energy-related water demands, and generating electricity from an emissions-free source, solar is a boon to long-term sustainability initiatives. Here’s a great talking point about the bullish solar market: The authors of the report, GTM Research and SEIA, state that if their forecasts for solar in 2014 prove to be accurate, it will mean that every 2.4 minutes in the US, another solar installation will be completed. If you’d like to know how you can be a part of this trend of incredible solar growth, take a few short minutes and get a free solar report for your property.